I would recommend this book to kids who like to read mythology. The book was very good, it kept me wanting to read more. It has lots of parts that you have to read carefully and think about, but once you understand it, it’s a very interesting book. That makes it good because you have to put some thought into it. Kids who actually take the time to read it will like it. The book Petra Volare is a great book for people who are interested in Greek myths and any kind of mythology, but it is also just a great story. If you like reading journal or diary books, you will also like this book. I was just starting to learn about Ancient Greece in school and I was half way through the book when I realized the names were Greek. The Everything List And What It All Means is also interesting to read, because you can see what the myth is in Petra’s world and in Ancient Greek myths. I can’t wait to see what happens in the next book. My mom gave me this book to read because she knew I love Greek mythology. I love how it was about the labyrinth and Icarus because I studied these mythical objects in school. I usually prefer faster paced books with lots of action, but I liked this because of the mystery element it had. I really like this book and recommend it to anyone who likes Greek mythology and mysteries and also to anyone else who wants to read a good book. My daughter, who just turned 11, began the book as soon as she received it, and she LOVED it and couldn’t put it down – it was hard to pull her away from her reading for dinner. She’s ranked it in the same category as the Harry Potter series and the Hobbit series! I just finished reading The Journals of Petra Volare-Scroll I: From the Shadows by Reece Michaelson and Pamela Jaye Smith and loved it. Not only for its creativity, information and story, but for the heroine, Petra, who I wish I had as a role model when I was 11 years old. I loved her courage, her following her own path and forging new ones. Petra Volare is a good read, filled with adventure and myth. In fact, I learned more about mythology than all the books I’ve read. This is a terrific book for young girls, teenagers and all women who want to be independent and true to their own destiny. This book will show them how. –Rachel Ballon, Ph.D. (rachelballon.com), referred to as “Doc Hollywood” by the Los Angeles Times, is an international script consultant, licensed psychotherapist and career coach, who specializes in writers’ personal and professional issues. As a psychological advisor and script consultant she has reviewed thousands of children’s scripts at United Paramount Network, Saban Entertainment, Fox Family Worldwide and Fox Kids. Rachel is author of five widely acclaimed writing books including Breathing Life Into Your Characters and The Writer’s Portable Therapist. A great read for middle school readers and adults, The Journals of Petra Volare, Scroll 1: From the Shadows is written in journal form from the perspective of Petra Volare, a young girl coming of age and to terms with her identity and her destiny. Petra’s mother, who has always kept Petra’s identity hidden from her famous father, Daedalus is not aware of all the changes nor the potential in Petra as she comes of age. Petra, with the assistance of those around her, begins to realize her own capabilities and insights. As Petra turns towards her own power and intuition, she begins to step out of the shadows and begins to forge her life with her own potential. She is observant, smart, and knowledgeable. This combination makes a strong female protagonist who must make decisions that will affect her and her family in this coming of age Greek Mythology story with a new twist. 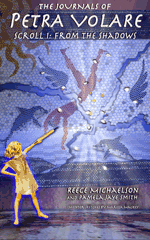 Mixing Greek Mythology, adventure, a bit of mysticism and a smidgeon of magic to the already known story of Icarus, Reece Michaelson and Pamela Jaye Smith bring each character to life in this page-turner adventure. I finally finished Petra Volare last night. I thought it was wonderful! Didn’t want to put it down. It was rich with texture, empowering for girls, charming and mystical. I was totally engaged with her and became more invested as I read further. I loved her teachers along the way, especially Phoenicia and the sailor. I loved the cave–and how it started out a scary place and ended up a safe and revelatory one. Learning about the story that is between the lines is a powerful lesson. I can’t wait to see what happens when she takes to the air on her next journey. Bravo! It’s a very special book. Thanks for sharing it with me. –Carole Kirschner, Entertainment Career Consultant and author of Hollywood Game Plan: How to Land a Job in Film, Video or Digital Entertainment. Petra Volare is a wonderfully plucky, appealing, can-do, must-do, doesn’t-know-she-can’t-so-she-does character set within the context of a time and place that invites and has, perhaps long awaited this offering of a heretofore “lost” – or at least untold – part of a myth. You present possible alternative realities that might very well have been. All together, you’ve created a platform that will enable you to keep re-imagining herstory. Need I say how empowering this is to young girls! In fact, to all females, regardless of age. There is a firm grasp here of what myth is, how and what it teaches us as well as how myths change over time, obscuring and changing earlier versions and details. First of a series? Great! –Mary Keil, Tony-nominated Broadway producer, STARMITES; writer/producer independent feature film SWING; co-author, Come Rain Or Come Shine: Friendships Between Women. I liked The Journals of Petra Volare, it was really good. Good plot and loved the characters. I liked the way the book was laid out too. And the journals which showed what happened to her in her own words. And I loved the ending too, the very last journal entry and the last two lines. This book is very riveting reading, thought provoking, holds one’s interest to the end and makes one want to start Scroll 2 NOW! I reacted similarly to the Harry Potter series, so I did practice patience like Petra Volare, with only moderate success. It also brought to mind Mary Renault’s 2 books on Theseus. Are there plans for future books in the series? The Journals of Petra Volare feels like a combination of Harry Potter, Plato, the Dead Sea Scrolls and ancient teachings from Atlantis (which feels a lot like Greece to me)…I love that you use the voice and perspective of this young girl (I love the hidden in the shadows imagery – and how she emerges from that) – her curiosity, musings, rebellious thinking, thinking for herself, the journey – the “vision quest” is how it feels to me – looking for answers. I so related to that…I was also touched by Calice’s feelings for her brother – and her insights into her father. Very interesting – and very emotional. …I like how the format made it easy for me to get clear words of wisdom. AND I like the wisdom you/Petra wrote! 1.What we’re taught obscures what we need to know. 2. Noticing patterns comes by being curious for a longer time than is comfortable, at least for me. I have never been good at patience. 3.Curiosity is a crucible – I must be willing to be uncomfortable and patient (the heat of the fire!!) in order to learn enough to complete an entire process. –Pamala Oslie (lifecolorscity.com), Author, Love Colors: A New Approach to Love, Relationships, and Auras; Life Colors: What Your Aura Colors Say About You; Make Your Dreams Come True. I just finished reading the book you sent me (The Journals of Petra Volare). Tell please the authors that I am impressed. Their imagination and knowledge of Greek mythology is outstanding. As a Greek I am proud that Reece and Pamela produced this book. And Gail could not have come up with a better cover. Please share this with them. We love your book! Clearly, the rich themes underlying Petra’s story are full of potential for adult reading group discussion — as you saw, there was plenty to discuss! We all hope this book reaches many people so that they can be enchanted and changed as we have been! Good luck! I think The Journals of Petra Volare is written by two women with the most incredible imagination, as well as an unusual style of writing which is captivating. They bring the reader into an early Greek history environment with a real sense of how events would have been played out. The main character is unique and true to her age and perception of life. I am looking forward to her next book which will be another combination of history and mythology. The journal entries captured my imagination throughout the whole book. Carefully crafted descriptions enable the reader to imagine various settings such as the labyrinth, the caves, the waterfront and the selected ‘shadows’ where Petra could observe the world around her…Petra’s unlimited curiosity and her ability to self-direct her learning are inspiring and delightful. The journal entries relating to her self-directed learning could provide fascinating discussion materials for students and teachers alike even in the 21st Century. Teachers who are implementing Common Core Curriculum Standards with their students will find a wealth of supporting material that spans several reading/language arts proficiency levels. 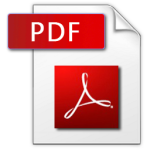 The authors provide an abundance of reference materials in addition to the journal itself. When is the next volume appearing? I can’t wait! I have read hundreds of middle grade and young adult novels over the years and this one is so different from any that I have read. I really enjoyed the blend of the expected and the unexpected as the story unfolds. I have taught most of my 21 years in middle school, I can definitely see students picking this one up. I think they will enjoy reading about a different twist to something they are familiar with. I caught myself thinking “Wow!” she [Petra Volare] is a very strong and determined character…taking matters in her own hands because the people around her acting so secretive and waiting for her to find her way. It makes her journey believable. I loved the fullness of this book. There are many books out there for young adults that don’t give the reader any credit to do some problem solving and make choices. This journey that Petra goes on allows the reader to be by her side the whole time. At times, I even felt the frustration she was going through and became impatient for her to resolve issues. The word choice was powerful, but not taxing. I think the readability was appropriate for early middle school, but the complexity of the story elements would be enjoyed by older students as well. The use of multiple levels within the structure of the myth of Daedalus and Icarus was both comforting and intriguing. I feel this book would be a popular book in our school library. I was totally captivated by Petra and her journey! One of my favorite things about Petra was how she learned to stop and breathe, and listen within; this it is incredibly important for all our students in this world at this time, but especially so for our girls. As soon as I finished the book, I began looking forward to the next one. I will take it to show my librarian. A truly inspiring and creative take on Greek mythology, The Journals of Petra Volare excites one’s imagination by seamlessly combining magic, mystery, and vibrant imagery. This is one of the best fantasy adventure novels since The Hobbit. I can’t wait to reread it and be inspired again and again. The Journals of Petra Volare, Scroll 1: From the Shadows is a fascinating and entertaining introduction to a curious, but determined young heroine, Petra Volare, who has spent her life living in the shadows, hidden from her legendary father, Daedalus, and kept from her soon-to-be-mythic brother Icarus. Fueled by mysterious ancient journals and her past-life dreams, Petra embraces her new-found awareness, in an effort to save her brother from a fiery death. Petra Volare is the mythic heroine all young girls will yearn to be as she inspires others to step forward, out of the shadows of conventional wisdom and into the light of challenging adventures towards much-deserved acceptance. –Kathie Fong Yoneda, (kathiefongyoneda.com), consultant and former studio executive; author of The Script-Selling Game (2nd edition). When you hear the name Pamela Jaye Smith in association with the word “mythology” you know you are in for a treat. The Journals of Petra Volare–written by Reece Michaelson and Pamela Jaye Smith—are no exception and certainly do not disappoint. Dusting off old legends and exploring both the truth and meaning behind the myths and fables designed to teach but too often relegated as fiction, the creators of this masterpiece shine a light for us all. While it is probably no surprise that the protagonist is a strong, skilled and determined girl, the new twists on an old tale are as delightful as they are enlightening. As Petra fulfils her own destiny we should each take a leaf from her book and fulfil our own by challenging some of our own assumptions based on ancient stories by which we live. This thought-provoking, enchanting and well-woven tale should encourage us all to do just that. If not, just enjoy the ride… but fasten your seatbelts because you’re in for a few surprises!! The Journals of Petra Volare: Scroll 1: From the Shadows is a unique and captivating blend of a number of usually highly disparate story elements. First, and most prominently, it is the surprising retelling and fresh version of one of the most famous of all Greek myths, that of the Minotaur, the great inventor, Daedalus, and his son Icarus, the boy who flew close to the sun. The myth is retold from the point of view of the heroine of this book, a young girl named Calice who has renamed herself Petra Volare. She has an intense personal interest in the characters involved in the myth and in the seeing that there is a happier outcome than in the conventional version. Petra, though young, is a true heroine, bravely facing dangers and unafraid to question the world she’s grown up in. She sets out on her own to acquire mentors who can teach her every useful skill she can think of, which pays off handsomely when it comes to helping those she loves. And she is unafraid to take matters into her own hands when there is no one else to turn to for help. In addition, this is a sensitively told family story with genuine emotional resonance, even though it is about a family that lived thousands of years ago. On still another level, it is a coming of age story about a girl who is struggling to come to terms with her identity and her destiny. And overall, it is an exciting adventure story with a mystery that is gradually uncovered as events unfold, intertwined with touches of mysticism and magic. I do think some aspects of the story, particularly the mystery and the duality of many of the characters, might be challenging for young readers to follow (and, to be honest, some aspects of the story were even challenging for me, an adult). However, the book has so many fascinating and emotionally rich elements that I think all readers will be swept along even when they might not fully comprehend every last detail. Furthermore, for those having trouble understanding who all the characters are, or feel a little lost with any of the mythological references, a helpful guide is included in the book. A teacher’s guide has also been written for it. I especially enjoyed the family story, including Petra’s somewhat difficult relationship with her mother, which felt very real, her unrequited love for her brother, who does not even know of her existence, and her mixed feelings about her famous father. And I would give anything to have a cup of the special tea Petra drinks, the dream tea, so I too could have such vivid and illuminating dreams! Overall, I would recommend this book to young readers. I think they will very much enjoy this book and be inspired by it. And I would recommend it to older readers as well, especially those with an interest in mythology and issues of personal identity. –Carolyn Handler Miller (CarolynMiller.com), screenwriter for many children’s TV shows (including Captain Kangaroo and an Emmy-nominated ABC Afterschool Special) and children’s video games (including Where in the World is Carmen Sandiego); and author of Digital Storytelling, Second Edition, A Creator’s Guide to Interactive Entertainment. Petra Volare is an amazing youngster who is an inspiration to everyone who meets her, myself included! She’s a girl who always doubts her talents and worth, like most children (and adults) who are trying to find themselves. Yet as Arkalochori says, ‘Doing one thing you never thought you could do makes it possible to believe you can do other things that look too hard.’ Petra bravely rises to the many challenges that she faces in her quests to save her brother and her best friend. Just like Pippi Longstocking was my childhood heroine, Petra is my new hero. As her mentor Petros pointed out, she is a girl who is owned by no one but herself. Petra has strong instincts and powers that she’s learning about through her various mentors. My nonprofit organization Create Now helps youth in need through arts mentoring and experiences. The power of mentors to impact us can be proven throughout history, and it’s what I have found to make the biggest difference in young lives. While the thousands of ‘forgotten children’ that our charity reaches have sadly fallen through the cracks, shuffled from emergency shelters to foster homes and detention facilities and back to the streets, it’s their mentors who keep them on track so they can reach their fullest potential. By providing these kids with ‘The Journals of Petra Volare,’ they now have a new role model to mentor them, someone whom they can relate to on so many levels. Petra instills curiosity and the desire to try new things, and to be open to mentors who can support them. What I admire the most about Petra is her ingenuity. She continually uses creativity to find solutions to problems, which is the goal of Create Now. 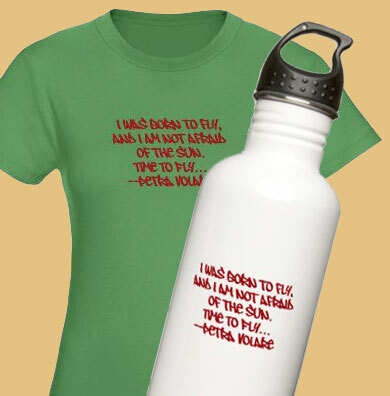 When Petra’s mentors guide her as far as they can, she digs into her heart and discovers innovative ways around problems, such as using the inside of her tunic to copy important information from a disk, and building a phenomenal flying machine based on nature to overcome her fear of drowning so that she can visit faraway places. Petra persists and doesn’t give up on her dreams, which are always cherished and analyzed to explore their deeper meanings. Just like Petra must reach her destiny by being courageous, I feel that her experiences are motivational lessons for all of us to learn from, regardless of our age. I personally resonated to Phoenicia’s statement that ‘Sacrifice is giving up the small for the great,’ along with many other stimulating ideas that are expressed in this book. I highly recommend ‘The Journals of Petra Volare: Scrolls 1: From the Shadows’ as a terrific source that will enable future generations to explore their hidden feelings to realize their own dreams. Thank you for providing this wonderful tool! –Jill Gurr, Executive Director of CreateNow (mentoryouthnow.com), a creative arts mentoring organization based in Los Angeles. She has been featured on NBC Nightly News with Brian Williams, and CNN’s Anderson Cooper 360°, as well as in the Los Angeles Times and the Hollywood Reporter.